New York Army National Guard Col. John Andonie was promoted to brigadier general during a ceremony at the state Division of Military and Naval Affairs Headquarters in Latham. Major Gen. Ray Shields, the adjutant general of New York, promoted Andonie during the ceremony. Andonie became the New York National Guard director of Joint Staff, responsible for coordinating joint Army and Air National Guard operations. 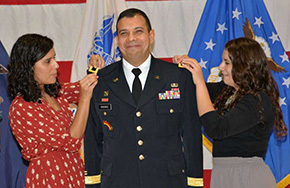 "People are the most important resource of the Army and the New York National Guard," Andonie said after he was promoted. "But those good, hard-working people need to work together as a team to accomplish important missions for the state and nation." As a member of the 42nd Infantry Division he served as chief of plans, deputy operations and operations officer. In 2004-2005 he deployed to Tikrit, Iraq, as the deputy operations officer of the 42nd Infantry Division. After returning from Iraq he served as the commander of the 1st Battalion, 69th Infantry — New York City's famous "Fighting 69th" — and as the deputy joint operations and operations officer for the New York National Guard.